Last week I was kindly invited to receive a treatment at The Little Blue Beauty Room in Mossley and I have honestly never had such a welcoming and wonderful experience than I did there. 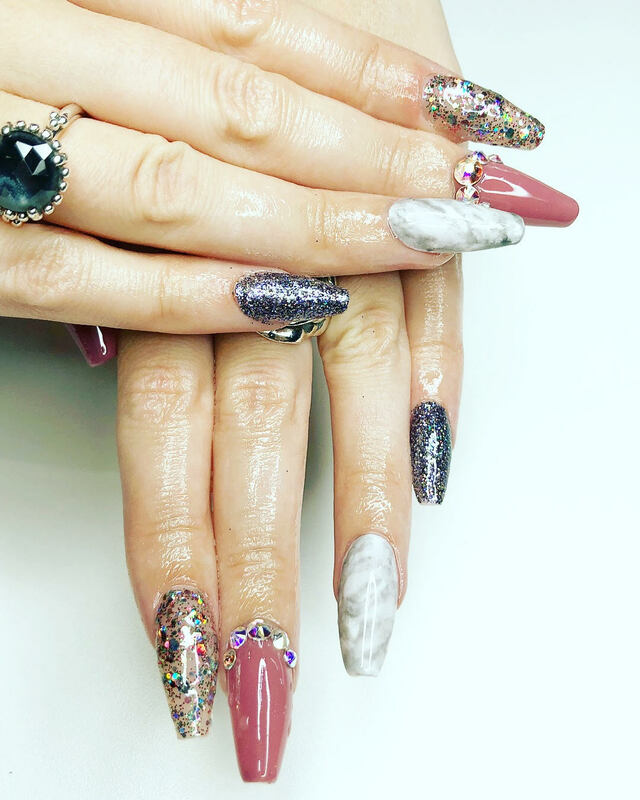 After being in touch over email it was decided that I would have a full set of Sculpted Acrylics with gel polish and nail art. Sculpted Acrylics are basically where the nail is built using the acrylic gel on what I can only describe as a little pointy hat that is stuck on the end of the finger for acrylic to be built upon, this method is used instead of gluing on a tip, it's much better for the health of your nail and means you won't end up (as the nail grows out) with an awful gap between the tip and the acrylic. 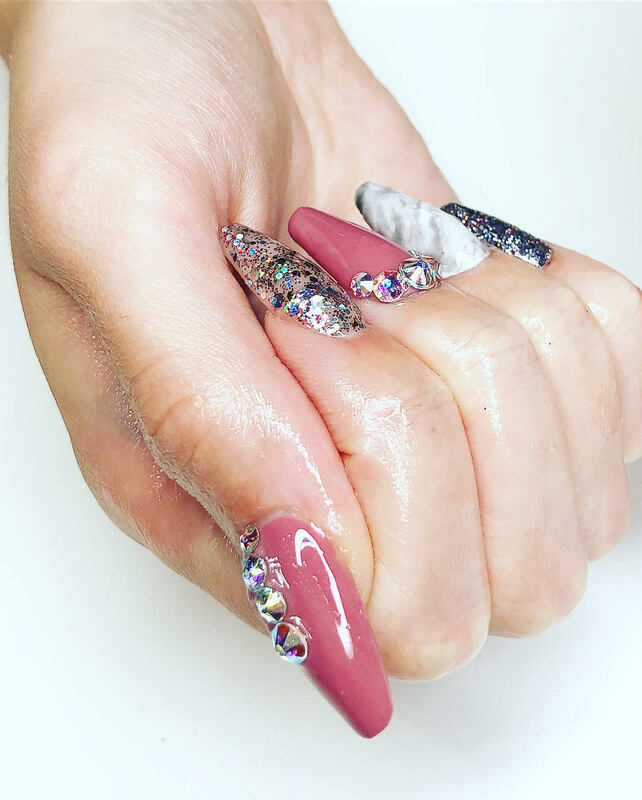 Amy gave me complete free rain on what designs I wanted and after trawling through Instagram I found these glamorous nails, which I tentatively asked if Amy could do... of course she could!! The only thing left before my appointment was to find out what drinks I wanted and what playlist we'd have on, I mean talk about star treatment!! The Little Blue Beauty Room's opening hours are perfect if you work 9-5, something that is so hard to find, so I booked in for 7pm on Friday after I'd finished work. Based in a garage conversion in Amy's (may I say beautiful) house in Mossley, true to it's name inside the walls are a gorgeous deep navy, there's a neon pink faux fire place, quirky framed prints on the wall, a bespoke cabinet with gold "Back, Sack and Shellac" detailing, it was major salon goals! I took a seat at the nail bar, my chair complete with pink faux fur cushion and Calvin Harris playing across the speakers. 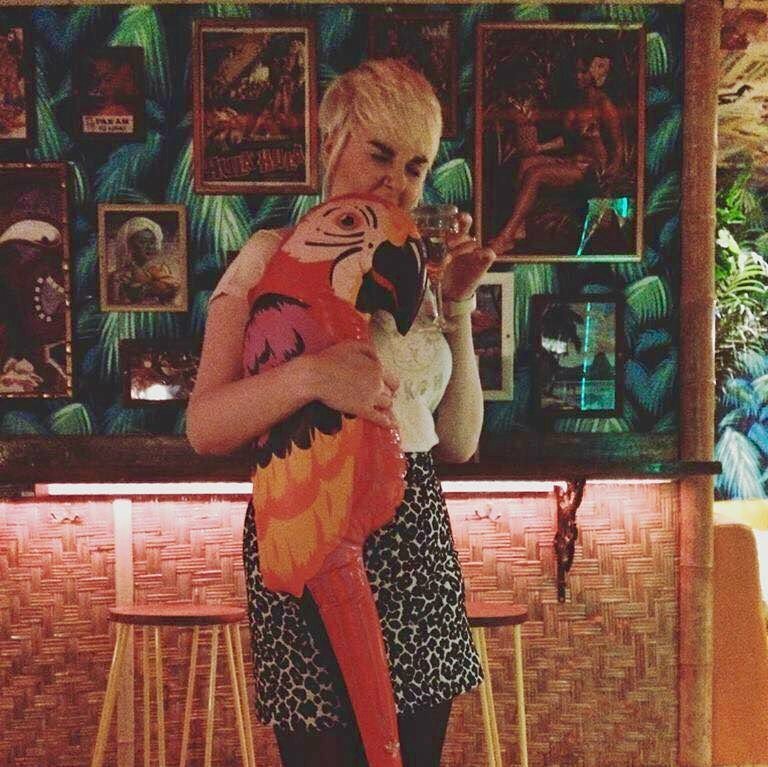 From the get go you immediately felt at home, chatting about music, fashion (we were wearing matching denim pinafores), hair salon disasters, going out in town and Amy's upcoming ghost hunting trip for her birthday, it was like sitting down with a mate for an evening! As you can see Amy did a fantastic job and I now have nails that would make even Cardi B jealous!! All in all it took around 3 hours but it was definitely worth it for the high quality finish I received. In the end I had Sculpted Acrylics, then with a gel polish and nail gemstones. 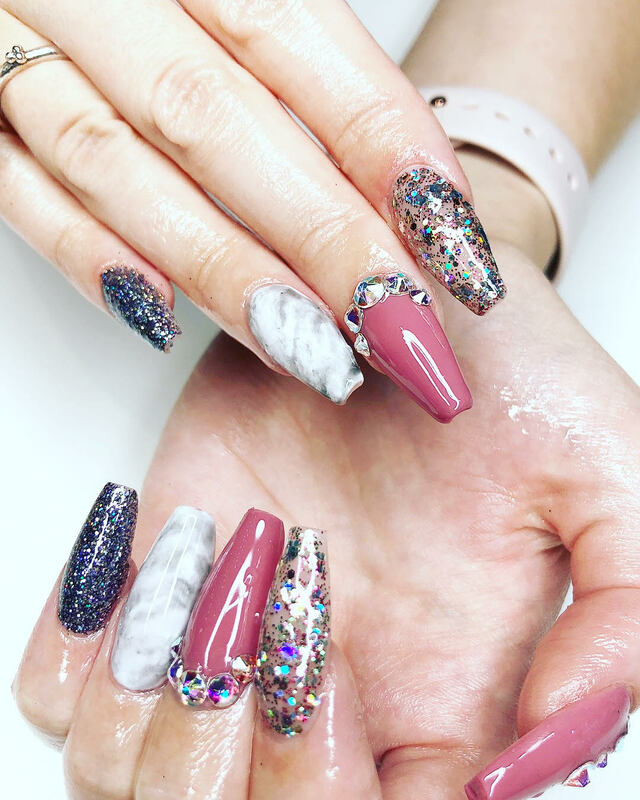 My favourite nail has to be the marble effect that Amy painstakingly did by hand!! I also love the glitter nails... lets face it I love them all!! I was also gifted with a nail and cuticle conditioner so I can keep my nails healthy (I know, I didn't even know that was a thing! ), it has a gorgeous almond smell, 'Ooo you could eat your fingers' - My Mum, 2018. As well as Sculpted Acrylics Amy has a great number of treatments on offer including Shellac, Waxing (If there's hair she'll wax it), Brow Tint and HD Brows (I'm keen to book in for that one). Open Monday to Friday 18.00 till 22.00 and over the weekend. Either contact her via Facebook or book in on thelittlebluebeautyroom.bookinbeautiful.com. I for one cannot wait to go back! 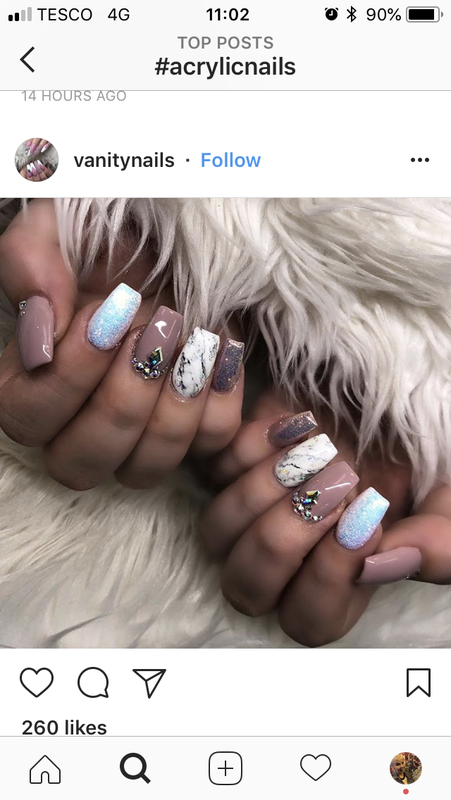 Check them out on Instagram for some serious nail envy!! Let me know if you've been!